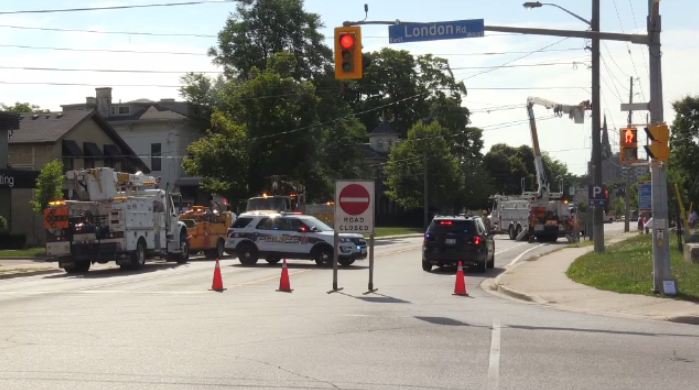 A hydro pole hit at vehicle in Guelph on Monday around 9:00 a.m. It happened on Woolwich Street between London Road and Charles Street. A bin truck travelling southbound when it got caught on a communications cable hanging over the road and pulled down a hydro pole, police said. The pole hit a nearby car as a result. The road was subsequently closed, and hydro crews were on scene for over an hour to make repairs. No one was injured, and no power was lost. The road reopened shortly after 10:30 a.m. It was unclear whether any charges would be laid. Woolwich Street was closed until just after 10:30 a.m. Monday.